Serving as hostess for this month’s Gluten-Free Ratio Rally, I wanted to challenge my fellow bloggers with patê á choux paste, also known as éclair paste. 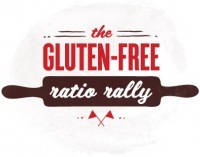 For those of you who are unfamiliar with the “GFree Rally” we are a group of GF blogger brought together by Gluten-Free Girl, Shauna, to prove that GF baking does not have to be difficult if you use know ratios/formulations used in the professional culinary world. The main caveat is that the only way to utilize these ratios/formulations is by weight (grams, ounces) as opposed to volume (cups). Measuring volumetrically leads to huge experimental error, meaning the chance of measuring what the true target is huge due to densities variations and user/measurement error. I saw this challenge as multifaceted: to introduce others to a classic pastry technique; to harness personal creativity since so many different things can be made with this paste; and to annihilate any notions that this dough can be made successfully and easily gluten-free. Patê á choux paste can be made into a variety of different delights such as éclairs, cream puffs, profiteroles (filled with softened ice cream), Paris-Breast, gougeres (French cheese puffs), paõ de queijo (Brazilian cheese bread), churros, beignets, funnel cakes, French cruller doughnuts, and many other things. As you can see, there are endless creations that can be made with this basic paste. Paste, you ask? That is really the only way to describe this dough. The viscosity of it is somewhere between a batter and a dough, which is critical for achieving the puff while holding the shape. Upon doing my research for patê á choux paste, it first became clear that this technique of cooking the flour in boiling liquid was to gelatinize the starches in the flour more so than relying on gluten for the structure of the final cooked product. Therefore, I quickly realized I was looking for something with a lot of amylopectin. Amylopectin is a starch that is found in a variety of products such as rice flours (especially sweet/glutinous, hence the name), tapioca and potato starches that when gelatinized (process of heating with water) forms a very elastic paste. I found this very exciting since it is so rarely seen in gluten-free baking, and reassuring that no gums are needed in keeping it together. My final ratio was roughly 1:2:1:1/fat: liquid:flour:eggs which differed by half the amount of eggs in both Michael Ruhlman’s Ratio Cookbook and Gisslen’s Professional Baking. I had a crazy idea in my head of taking gougeres to a whole new level and fill them with something light, airy, full of flavor, and more cheese. Gougeres to me are divine, yet I just find them one dimensional. So much empty space inside them that can be filled with deliciousness. I chose goat cheese as the primary vehicle with an assortment of different fresh herbs and lemon zest to brighten it up and gently folded in whipped cream to lighten it into a mousse. What herbs you choose is completely up to you with the exception of chives, which I find critical, such as basil, mint, etc. Fresh herbs take just about any dish to another level, and then the need for salt is decreased. The final touch is to bake the gougeres with a sprinkling of salt to connote them as savory. This way it gives a visual cue expecting something savory. Heat oven to 425F. Scale / weigh the butter, liquid, and salt into a medium to large heavy-walled saucepan. Scale / weigh the sweet rice flour into a small mixing bowl; combine until uniform. Heat the liquid and butter over medium heat to a roaring bowl. Remove from heat to add in the flours, return to heat, all while stirring vigorously with a wooden or metal spoon. Cook for at least 2-3 minutes until the oil starts to separate out, and the dough becomes elastic. Immediately turn into a stand mixer with a paddle attachment (with the scrapers work best) and stir on speed 2-3. Allow to cool just slightly, so it is not unbearable to touch, and slowly add in the room temperature eggs. Allowing time for the paste to absorb the eggs. This small incremental addition is critical for best results. You will see how the paste seems to fall apart during the addition, and then comes together. Alternately, if you do not have a stand mixer, the addition of eggs can be done by hand, it just requires a little strength. The target thickness / viscosity of the paste is one that can be piped through a pastry bag, yet holds its shape. Finally, add in the grated cheese and garlic powder. Using a 1 ounce scooper, dose the gougere paste on parchment, allowing at least 1 inch between. I find I can fit 12 on a household standard ½ sheet. Sprinkle a small amount of finishing salt on each gougere. Place both sheets in the oven at the same time. Bake for the first 8 minutes at 425F – no peaking! Opening the oven can deflate them. Reduce the heat to 375F and bake for an additional 10 minutes. These times may vary from oven to oven, so keep an eye on them, without opening the oven. Make sure they are thoroughly browned, including the slides. Otherwise, they can deflate. Remove from oven, transfer to wire/cooling rack, and put a small hole in the center of the bottom using the tip of a paring knife. Turn right-side up and allow to cool completely before filling. In a medium mixing bowl, scale the room temperature goat cheese and soften by mixing with a silicone spatula. Add the aromatics, herbs, zest, stirring between to make sure it does not seize up. In a separate mixing bowl, whip the heavy whipping cream to stiff peaks, but do not over beat. Stiff peaks are those in which when you hold up the beaters, the cream peaks stay upright. In small additions, about 3-4, fold in the whipped cream into the goat cheese and herb mixture. I best describe folding as an over exaggerated yet simplified stirring, where you hold the bowl at an angle and mixture top to the bottom. With small additions of folding, a lighter and fluffier product is achieved. Transfer the herbed goat cheese mousse to a pastry bag equipped with a small (size 002) tip. Carefully place the tip just in the hole in the bottom of the gougere held in in the palm your other hand. Gently squeeze the pastry bag to fill. You should feel a slight weight added to the gougere and see that it slightly puffs, yielding a slight resistance. Stop right there. Repeat until all the gougeres are filled. You will get the hang of it. It does take practice. I usually leave them upright since some of the filling tends to ooze out. Just wipe with a butter knife. Then, place on a sheet and chill in the refrigerator until ready to serve. Cover loosely with a layer of paper towels, then plastic wrap if more than 2 hours to maintenance a smell/taste protectant. Holds well in fridge for up to 2 days. I made another item for our patê á choux challenge: Churros y Chocolate Sin Gluten (milk-free & egg-free / vegan) Check it out, too! I'm so glad I found your blog. My last attempt at gf choux pastry was a bit of a failure but I've just tried this one and it was a huge success. I made half the batch as gougeres and chocolate eclairs with the other half. What do you suggest if the inside is still a little undercooked after cooling and slicing - is that acceptable or would you put them in the oven to dry them out a little? Erin, these look amazing! I'll be making these for the family tonight to go with my dijon-rosemary pork tenderloin. Yum! I really enjoyed tackling this pate a choux project. Thanks for leading me on such a great baking experiment. I can't wait to bake up another batch of cream puffs. And definitely some gougeres soon too! My mouth is seriously watering right now. I LOVE that you filled these with such a yummy concoction! I would love to have one right now! Holy heck. Pure cheesy genius. Sounds divine! Yum, goat cheese mousse! I love that this mousse sounds so easy and delicious without any of the scary ingredients that savory mousse can have. I really have to try the savory gougeres at my next dinner party! Loved the theme. Thanks for hosting! Thanks so much for hosting Erin! This was certainly a challenge for me and I learned a lot - and wow will def. be making that herbed goat cheese mousse soon! holy moley those look good, erin! i'd love one for lunch... thanks for hosting us this month!! I know that I'm vegan and all, but this makes me seriously crave herbed goat cheese. Maybe I'll have to make some with herbed tofu ricotta! Yes! And thanks so much for hosting—I had so much fun, and I'm looking forward to continuing plying around with this paste thanks to everyone else's recipes. Thank you so much for adding me the last minute. It truly means a lot, especially with you hosting last month's GFRR. Your recipes look absolutely fantastic! They look amazing, Erin! Sweet rice flour seems to have worked well for a lot of people - maybe I'll play with that in one of my next batches. Thanks so much for hosting this month! All your chemistry expertise was much needed and appreciated! So many good recipes this month! I'll have to try this next time I have people over. Absolutely GORGEOUS Mousse! I'm definitly going to be dreaming about this one. Aw. All you guys are too sweet. Have to admit, this was so damned good that I'm making again this weekend. Anyone else tried replicating these? How did they work for you? Filling these with something rich like the goat cheese & lemon to brighten it is enlightened. How lovely! I'm curious: what is next months rally? Hi Erin, I've looked, but maybe I missed the yield for this recipe. How many gougeres will this make approx?